MB&F has just introduced its most complicated timepiece yet, the Legacy Machine Perpetual, a perpetual calendar featuring an ingenious, robust and integrated calendar mechanism. Typically complex and easily broken, the perpetual calendar has been made foolproof with the new MB&F Legacy Machine Perpetual. 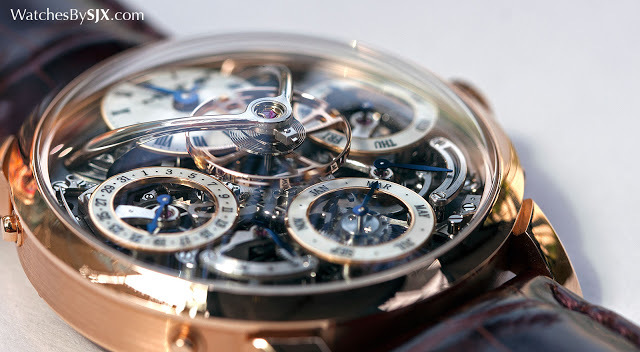 Developed by Irish watchmaker Stephen McDonnell, the Legacy Machine Perpetual accomplishes that by rethinking the traditional calendar mechanism both technically and visually, resulting in a watch easily adjusted via pushers and featuring a skeletonised dial that reveals the intricate workings of the calendar. 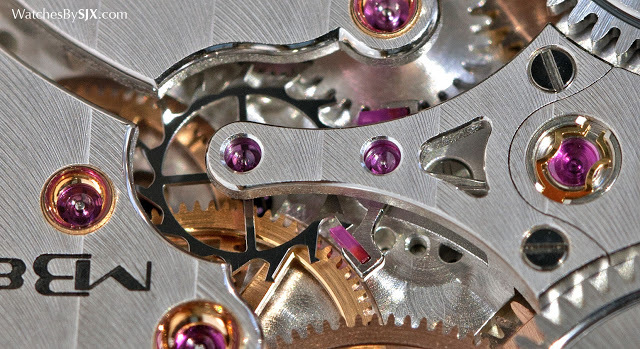 Ordinary perpetual calendar mechanisms have gears set up for a 31-day month. For months with less than 31 days, the mechanism quickly cycles past the extra days (29, 30 and 31) to arrive at the 1st of the following month. This is powered by gears, levers and springs, with one large date lever that triggers the other indications. Stephen McDonnell, however, had other ideas. 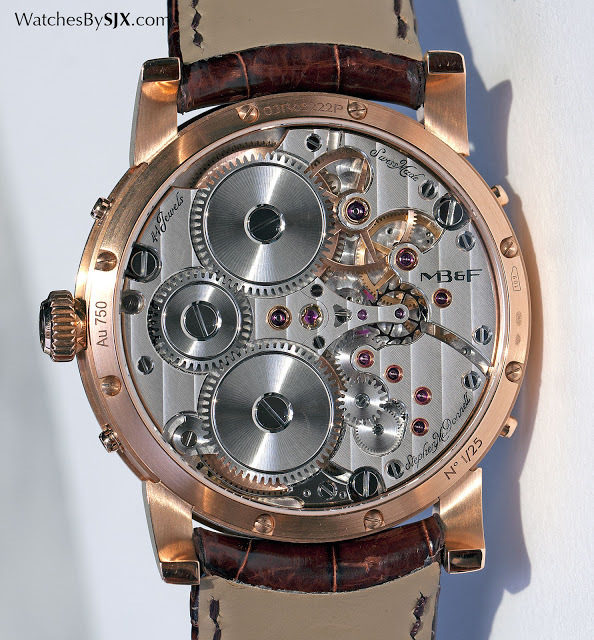 An Irish watchmaker who was formerly an instructor at Swiss watchmaking academy WOSTEP (short for “Watchmakers of Switzerland Training and Educational Program”), McDonnell was instrumental in getting MB&F off the ground when it was established. He helped assemble and finish the brand’s first wristwatch, the HM1, after it ran into delays with its movement supplier. McDonnell’s construction relies on a 28-day month, with gearing to account for extra days when necessary. A stack of gears, with each to trigger one calendar indication, is the heart of the perpetual calendar. Because it has a smaller footprint than a traditional lever-based mechanism, the entire calendar mechanism can be open-worked and visible on the dial. While the construction of the calendar makes it more robust, it also has a built-in safety function that disengages the buttons on the case when the date is changing across midnight. Pressing the buttons during the date change has no effect, preventing any damage to the movement. 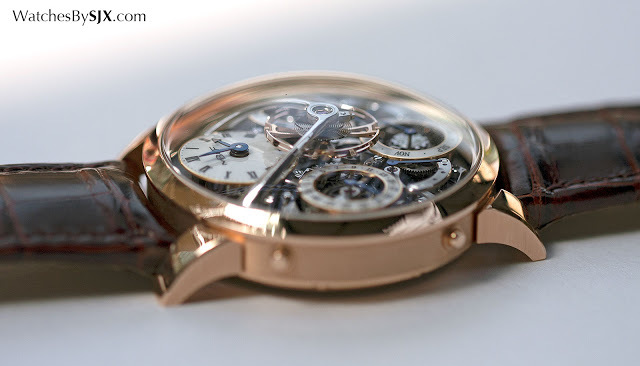 Besides the easy to access buttons on the case – they are raised so no stylus is needed – the Legacy Machine Perpetual also has a leap year indicator that can be set directly. That differs from traditional calendars that require advancing the month to change the leap year. 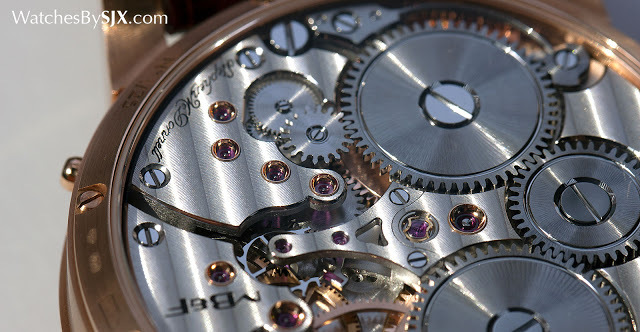 Despite being simpler to use, the Legacy Machine Perpetual movement is more complex in construction, comprised of some 581 parts. That’s more than the 475-component count of the movement inside the HM6 tourbillon, and in fact more than any other MB&F movement to date. In contrast, a typical perpetual calendar movement, like the Patek Philippe calibre 240 Q for example, is made up of 250 or so components. 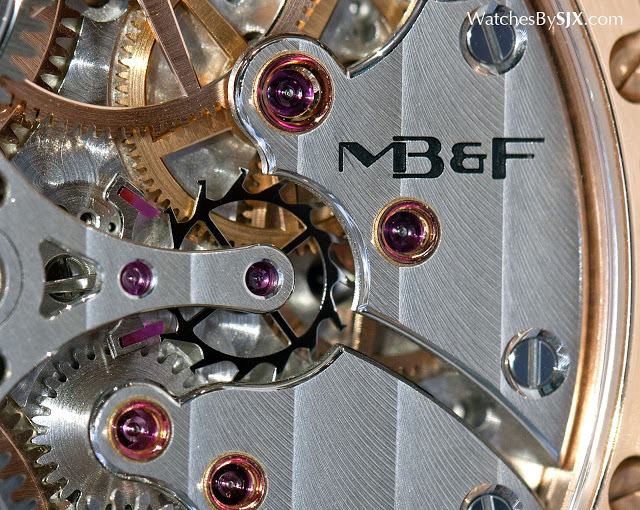 Though the complication is the first of its kind for MB&F, the aesthetic follows that established by the earlier watches in the Legacy Machine series, namely the LM1 and LM2. 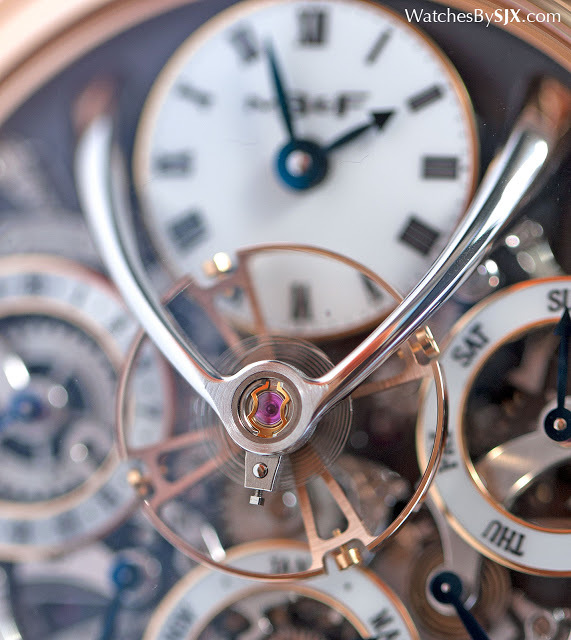 Towering over the calendar is an enormous balance wheel, the signature feature of the Legacy Machine series. Beating at a languid 18,000 beats per hour, it’s held aloft by a large, arched bridge made of steel that’s been rounded and polished. 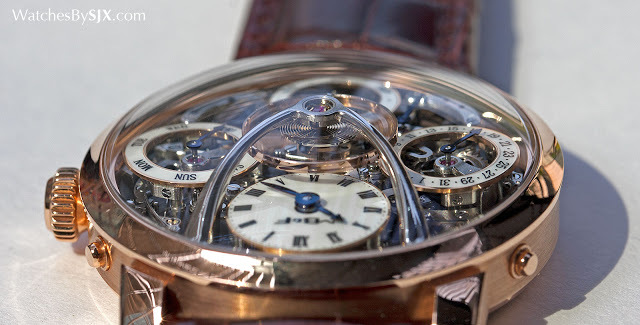 The balance wheel in turn is connected to the escapement on the back of the back via an exceptionally long balance staff that’s almost as long as the watch is high. Because the balance sits so high, the crystal on the front is high and domed to accommodate. 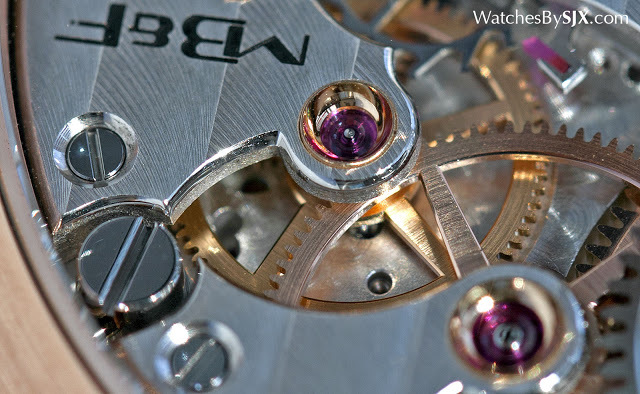 The movement is impressively decorated, with carefully shaped bridges with inward corners that bespeak of a high level of hand-finishing. Wide polished bevels with sharply defined lines frame all of the bridges, which have surfaces covered in strongly defined Geneva stripes. Even the pallet fork is polished on its face and bevelled on its edges, illustrating a degree of finish that’s the best yet found on an MB&F. 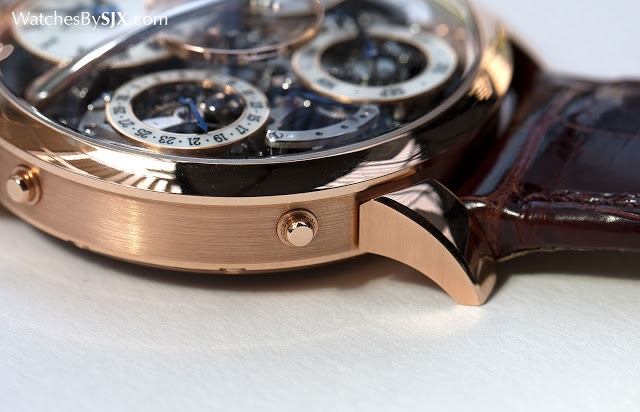 The result is reminiscent of Laurent Ferrier movements, most probably finished with similar techniques. 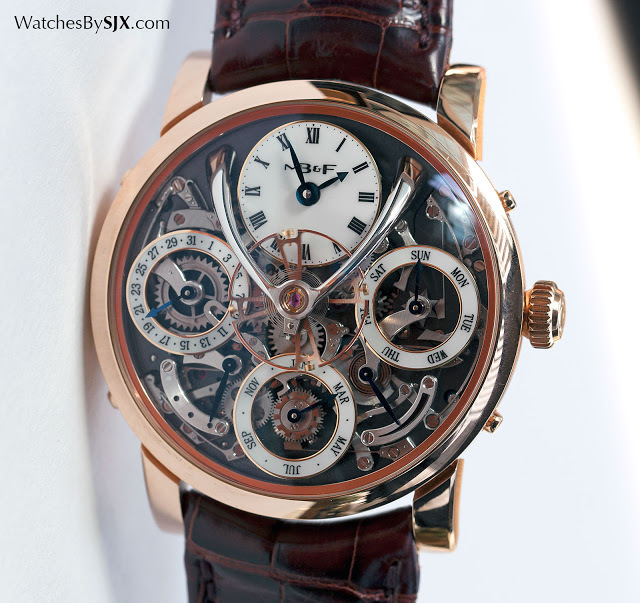 The Legacy Machine Perpetual is substantially sized, with a 44mm case that’s 17.5mm high. 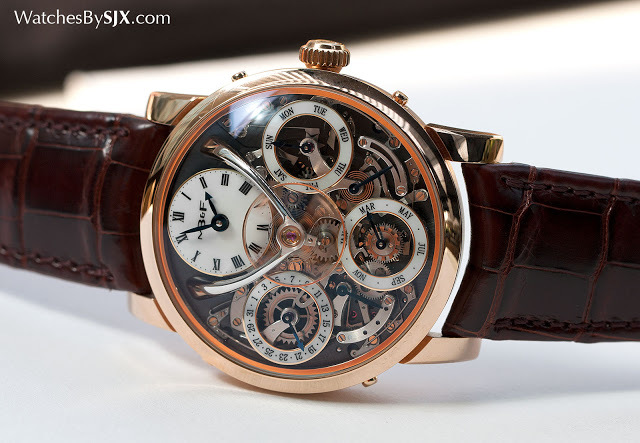 It’s a limited edition of 25 pieces each in red gold and platinum, priced at SFr138,000 and SFr168,000 respectively. That puts the Legacy Machine Perpetual amongst the priciest perpetual calendar watches on the market, though it is also amongst the most complicated and finely finished. 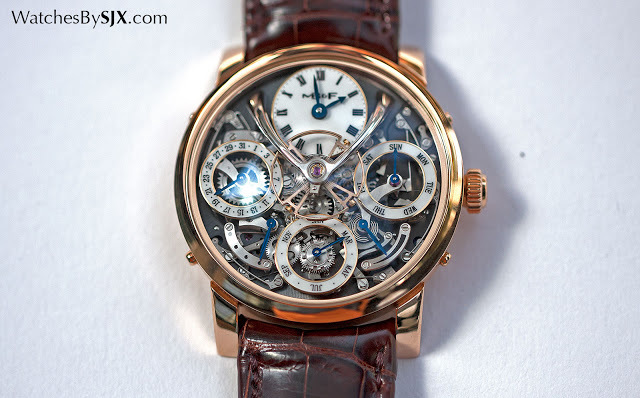 Future editions of the Legacy Machine Perpetual will be introduced in subsequent years in different case materials.